This is such an adorable quote isn’t it? A real quick and easy one this time. I simply dropped my Distress Paints from a couple of inches off my paper. Sort of let it happen where it wanted to, rather than trying to be really random. 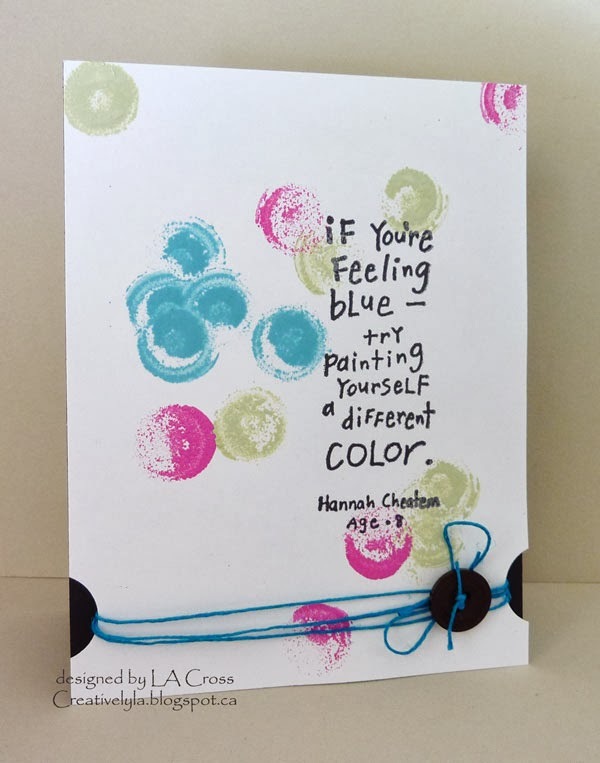 Once the paint was dry, I stamped the sentiment in Ranger Archival Ink. The two sides were punched with a circle punch, then I wrapped some hemp twine around it and added a button. Next it was mounted on a black card base and done! This is precious, Lee-Anne. I think those are the cutest sentiments. Cool way to get those wonderful paints on there. I love it. Very creative, colorful, and a great sentiment too! Lee-Anne, this is totally darling! That sentiment is so profound coming from an 8 year old. Your colorful dots are “spot on”! Lovely dauber dots! Great take on this weeks PAINT cue!! Fun design, love the punched edges. Thanks for playing along at CASology this week!